It’s okay to play around! Choose from four Play Golf Kelowna (PGK) passes. Each card offers a progressively bigger savings at each of the participating golf courses and practice facilities - each locally owned and operated. Purchase your card online below, call the Pro Shop at 250-765-7777 to order, or learn more by visiting the PGK website here. 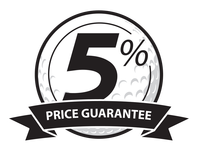 If you see an 18-hole green fee rate offered lower than what your PGK card offers at any of the courses (excluding regular, weekly league play), you will be given an additional 5% off - guaranteed. Get the Addicted Golfer Card benefits by loading only $400 on a Value Card. Reload your Value Card as you see fit throughout the golf season. Includes 7 individual Addicted Golfer Value Cards, loaded up with $1,000 per card. Only available until April 30, 2019.